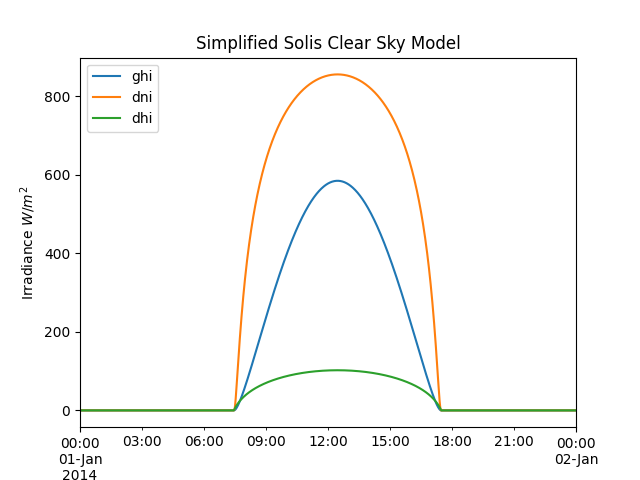 This section reviews the clear sky modeling capabilities of pvlib-python. A Location object’s get_clearsky() method. The functions contained in the clearsky module, including ineichen() and simplified_solis(). Users that work with simple time series data may prefer to use get_clearsky(), while users that want finer control, more explicit code, or work with multidimensional data may prefer to use the basic functions in the clearsky module. The Location subsection demonstrates the easiest way to obtain a time series of clear sky data for a location. The Ineichen and Perez and Simplified Solis subsections detail the clear sky algorithms and input data. The Detect Clearsky subsection demonstrates the use of the clear sky detection algorithm. We’ll need these imports for the examples below. The easiest way to obtain a time series of clear sky irradiance is to use a Location object’s get_clearsky() method. The get_clearsky() method does the dirty work of calculating solar position, extraterrestrial irradiance, airmass, and atmospheric pressure, as appropriate, leaving the user to only specify the most important parameters: time and atmospheric attenuation. The time input must be a pandas.DatetimeIndex, while the atmospheric attenuation inputs may be constants or arrays. The get_clearsky() method always returns a pandas.DataFrame. The get_clearsky() method accepts a model keyword argument and propagates additional arguments to the functions that do the computation. See the sections below for more detail on the clear sky models. The Ineichen and Perez clear sky model parameterizes irradiance in terms of the Linke turbidity [Ine02]. pvlib-python implements this model in the pvlib.clearsky.ineichen() function. 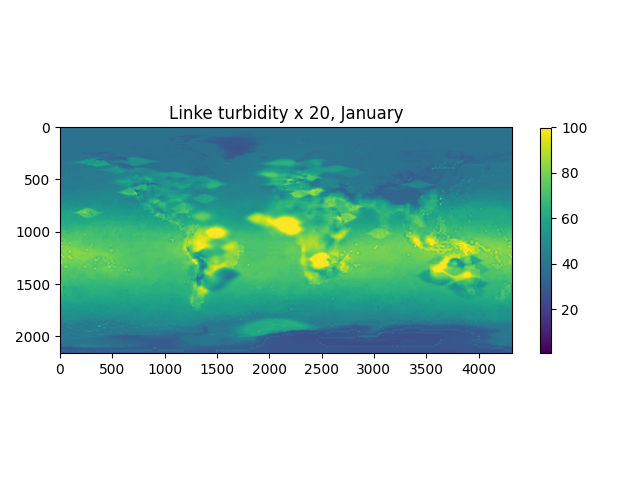 pvlib includes a file with monthly climatological turbidity values for the globe. The code below creates turbidity maps for a few months of the year. You could run it in a loop to create plots for all months. 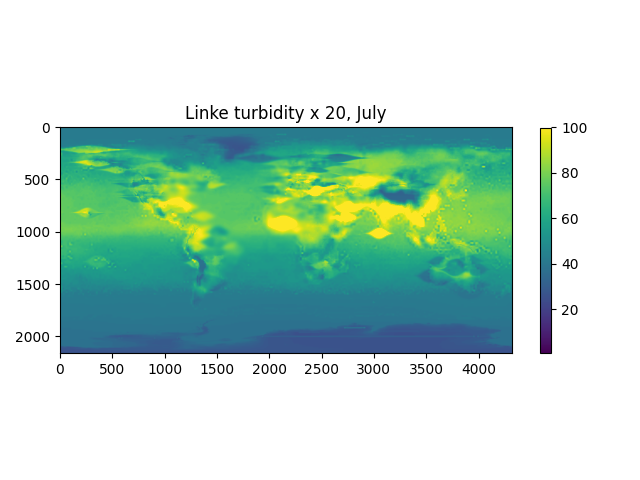 The lookup_linke_turbidity() function takes a time, latitude, and longitude and gets the corresponding climatological turbidity value for that time at those coordinates. 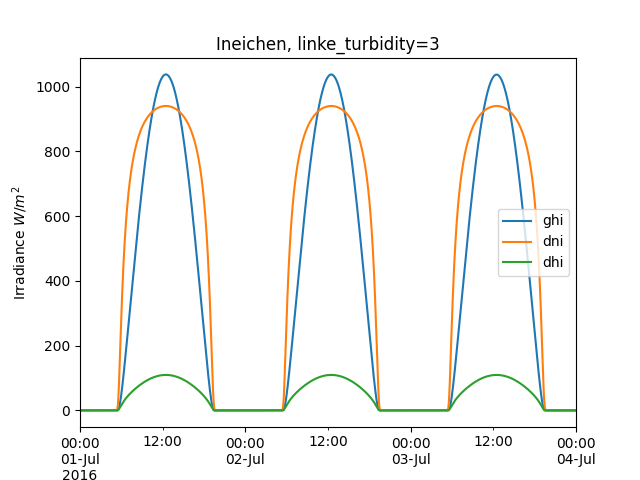 By default, the lookup_linke_turbidity() function will linearly interpolate turbidity from month to month, assuming that the raw data is valid on 15th of each month. This interpolation removes discontinuities in multi-month PV models. 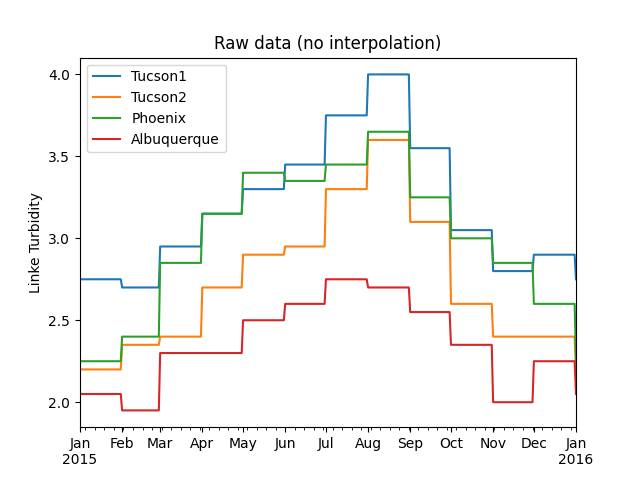 Here’s a plot of a few locations in the Southwest U.S. with and without interpolation. We chose points that are relatively close so that you can get a better sense of the spatial noise and variability of the data set. 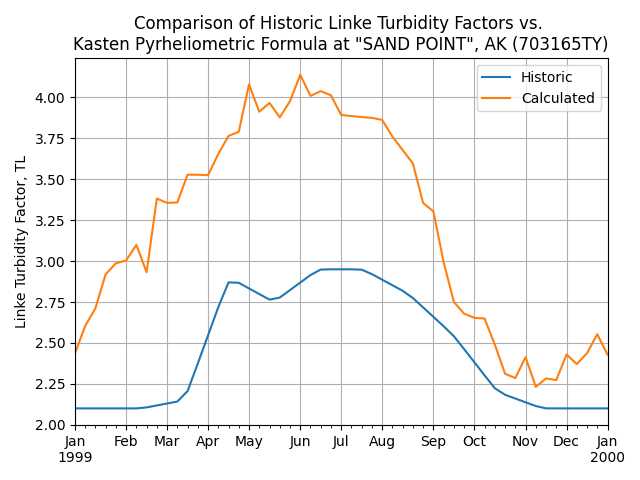 Note that the altitude of these sites varies from 300 m to 1500 m.
The kasten96_lt() function can be used to calculate Linke turbidity [Kas96] as input to the clear sky Ineichen and Perez function. The Kasten formulation requires precipitable water and broadband aerosol optical depth (AOD). According to Molineaux, broadband AOD can be approximated by a single measurement at 700-nm [Mol98]. 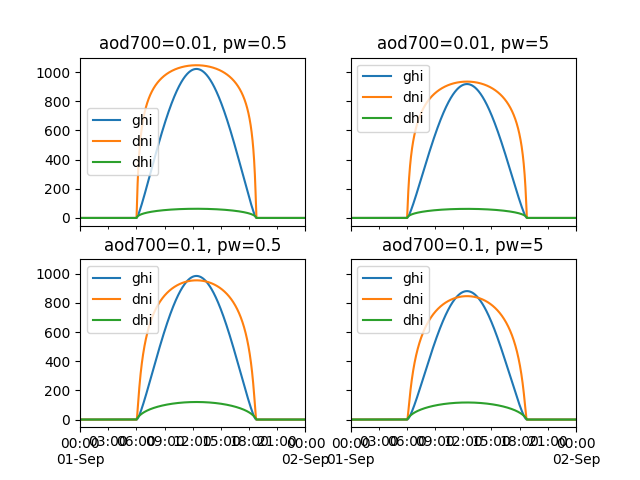 An alternate broadband AOD approximation from Bird and Hulstrom combines AOD measured at two wavelengths [Bir80], and is implemented in bird_hulstrom80_aod_bb(). 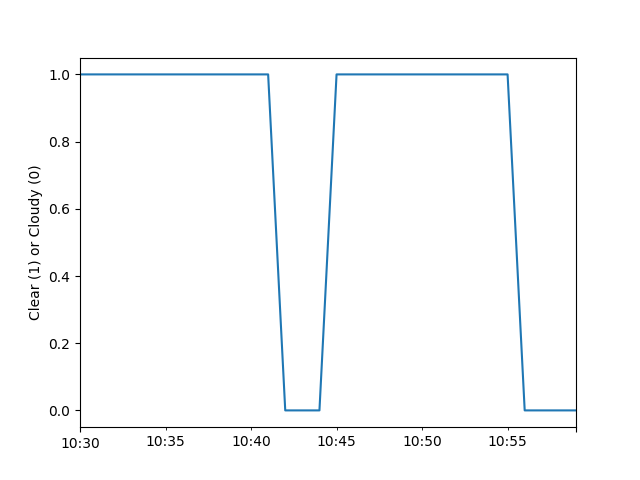 A clear sky time series using only basic pvlib functions. The input data types determine the returned output type. Array input results in an OrderedDict of array output, and Series input results in a DataFrame output. The keys are ‘ghi’, ‘dni’, and ‘dhi’. 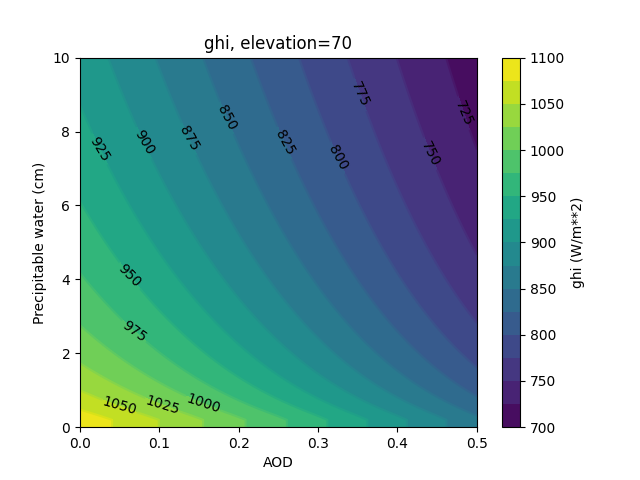 Grid with a clear sky irradiance for a few turbidity values. 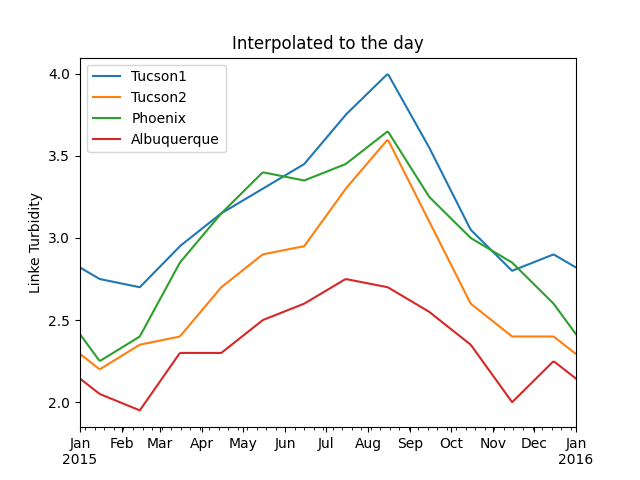 Will Holmgren compared pvlib’s Ineichen model and climatological turbidity to SoDa’s McClear service in Arizona. Here are links to an ipynb notebook and its html rendering. 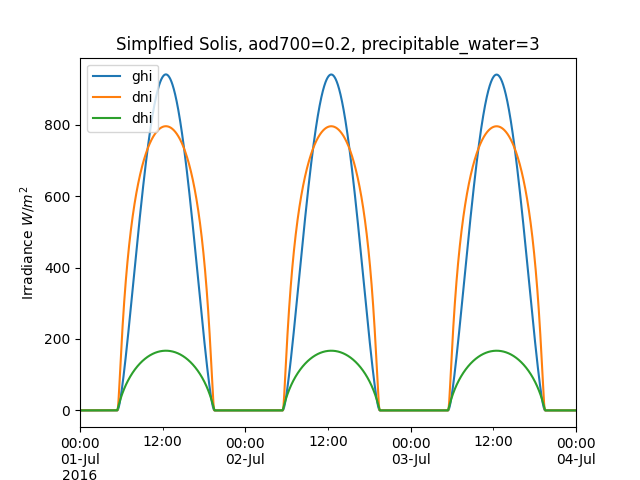 The Simplified Solis model parameterizes irradiance in terms of precipitable water and aerosol optical depth [Ine08ss]. pvlib-python implements this model in the pvlib.clearsky.simplified_solis() function. There are a number of sources for aerosol and precipitable water data of varying accuracy, global coverage, and temporal resolution. Ground based aerosol data can be obtained from Aeronet. Precipitable water can be obtained from radiosondes, ESRL GPS-MET, or derived from surface relative humidity using functions such as pvlib.atmosphere.gueymard94_pw(). Numerous gridded products from satellites, weather models, and climate models contain one or both of aerosols and precipitable water. Consider data from the ECMWF and SoDa. Aerosol optical depth (AOD) is a function of wavelength, and the Simplified Solis model requires AOD at 700 nm. 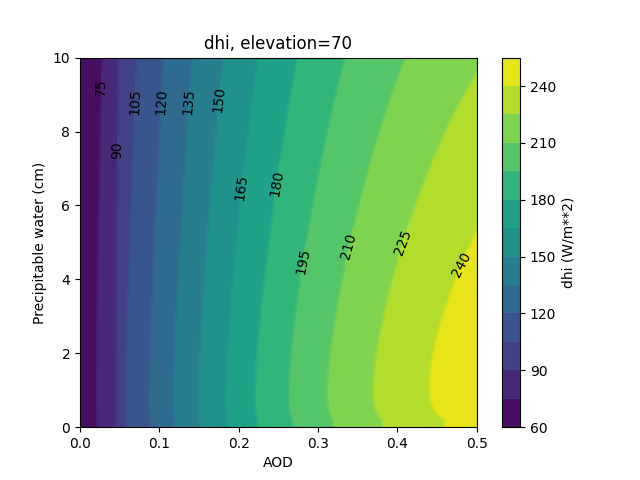 angstrom_aod_at_lambda() is useful for converting AOD between different wavelengths using the Angstrom turbidity model. The Angstrom exponent, \(\alpha\), can be calculated from AOD at two wavelengths with angstrom_alpha(). [Ine08con], [Ine16], [Ang61]. 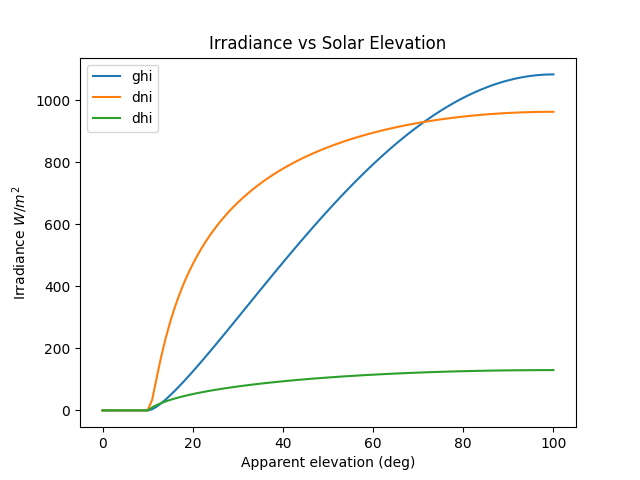 Irradiance as a function of solar elevation. Grid with clear sky irradiance for a few PW and AOD values. Contour plots of irradiance as a function of both PW and AOD. We encourage users to compare the pvlib implementation to Ineichen’s Excel tool. 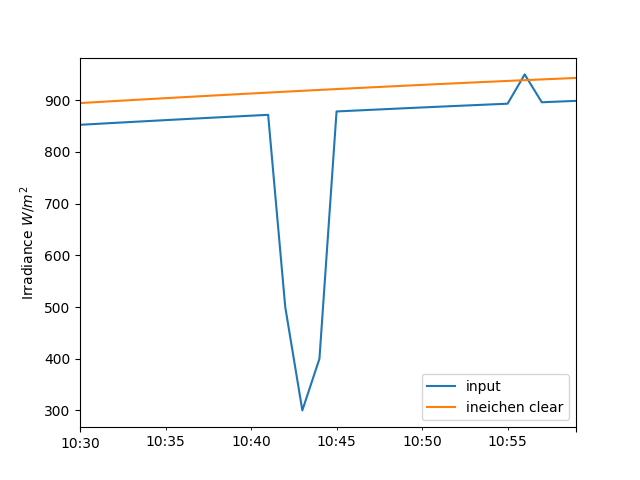 The detect_clearsky() function implements the [Ren16] algorithm to detect the clear and cloudy points of a time series. The algorithm was designed and validated for analyzing GHI time series only. Users may attempt to apply it to other types of time series data using different filter settings, but should be skeptical of the results. The algorithm detects clear sky times by comparing statistics for a measured time series and an expected clearsky time series. Statistics are calculated using a sliding time window (e.g., 10 minutes). An iterative algorithm identifies clear periods, uses the identified periods to estimate bias in the clearsky data, scales the clearsky data and repeats. Clear times are identified by meeting 5 criteria. Default values for these thresholds are appropriate for 10 minute windows of 1 minute GHI data. Next, we show a simple example of applying the algorithm to synthetic GHI data. We first generate and plot the clear sky and measured data. 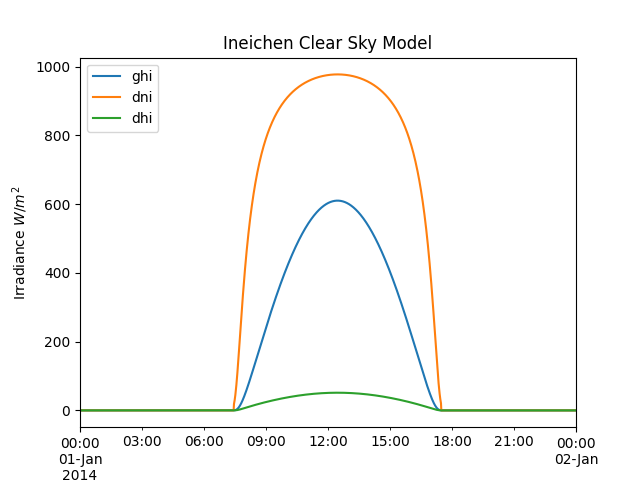 Now we run the synthetic data and clear sky estimate through the detect_clearsky() function. The algorithm detected the cloud event and the overirradiance event. P. Ineichen and R. Perez, “A New airmass independent formulation for the Linke turbidity coefficient”, Solar Energy, 73, pp. 151-157, 2002. P. Ineichen, “A broadband simplified version of the Solis clear sky model,” Solar Energy, 82, 758-762 (2008). P. Ineichen, “Validation of models that estimate the clear sky global and beam solar irradiance,” Solar Energy, 132, 332-344 (2016). P. Ineichen, “Conversion function between the Linke turbidity and the atmospheric water vapor and aerosol content”, Solar Energy, 82, 1095 (2008). M. Reno, C. Hansen, and J. Stein, “Global Horizontal Irradiance Clear Sky Models: Implementation and Analysis”, Sandia National Laboratories, SAND2012-2389, 2012. Reno, M.J. and C.W. Hansen, “Identification of periods of clear sky irradiance in time series of GHI measurements” Renewable Energy, v90, p. 520-531, 2016. B. Molineaux, P. Ineichen, and N. O’Neill, “Equivalence of pyrheliometric and monochromatic aerosol optical depths at a single key wavelength.,” Appl. Opt., vol. 37, no. 30, pp. 7008–18, Oct. 1998. F. Kasten, “The linke turbidity factor based on improved values of the integral Rayleigh optical thickness,” Sol. Energy, vol. 56, no. 3, pp. 239–244, Mar. 1996. R. E. Bird and R. L. Hulstrom, “Direct Insolation Models,” 1980. A. ÅNGSTRÖM, “Techniques of Determinig the Turbidity of the Atmosphere,” Tellus A, vol. 13, no. 2, pp. 214–223, 1961.